Friday – Sunshine Coast: Rain and a sky full of dark, heavy clouds. I had second thoughts for a few minutes … spending my long weekend attempting a 100 km trail run in the rain. What about some sun, beach and beers? The race briefing the same night, during the pasta dinner, did not help to improve my mood. We were informed about section A being very muddy, section B full of water, section C extremely slippery, and I never got an answer about which section would be dry! 5:30 am start and the first 20 km were most enjoyable – chatting to fellow runners, enjoying great scenery and after some failing attempts to keep my shoes dry, even the water and mud pools did not bother me any longer. I kept strictly to my running plan, and I arrived at my first planned stop (CP5/30 km) in just over 3 hours. The mud was manageable and the hills so far fine. A drink, a couple of boiled potatoes and some fruits later, off I was towards the Goat Track section. On the way, I met a fellow runner, who ran for 4 km the wrong way! Does not sound much, but if you plan to finish 100 km, every extra meter could be too much. At km 35, I had a second stop to re-stock with extra drinks, gels and a change of shirt. ‘Freshly dressed’, I attacked the famous Powerlines Section, where I encountered some motor trail bikers along the way and then made my first close contact with the mud-sliding and slipping my way up and down the trail along the powerlines. Arriving at CP8/45 km, I looked more like someone coming off the Kokoda Trail during full rain season, but prepared as I was, I quickly changed into another new shirt, a fresh pair of socks and after two 10-km-loops in the forest, with a fresh pair of shoes on my feet, I was well ready for the second half of my race. I found some hidden strengh and ran a very comfortable 5’/km- pace back towards CP6/80 km for some more food and new socks. Now it was off into a hard up-and-down section around Mt Beerwah before it got dark. I was glad to have a buddy along with me to chat, which helped us both to make that section feel a bit shorter. We both just managed to run into CP5/91 km before it got dark. 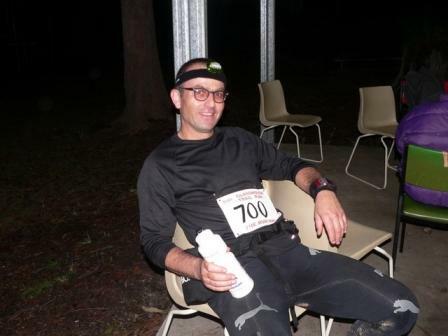 A couple of nice, sweet cups of tea later, I put my headlight on and got up to finish the last 10 km of my race in the dark. A new feeling – tired and looking forward to that hot shower – I started dreaming along, and was glad some fellow runner caught up with me just in time to stop me running the wrong way at an intersection. 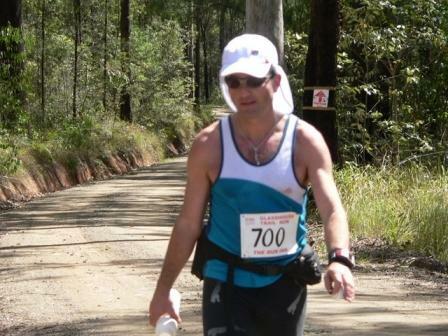 Up the last hill, across some more waterpools, and well-wishing all the 100-miles-runners, I crossed the last 4 km. I sprinted to the finish, trying to get there under 14 hrs. Well, almost………….. 14 hrs and 08 min later, at 8:38 pm, I was back at the beginning! You’re my hero! Love you.